Rise and Bake! 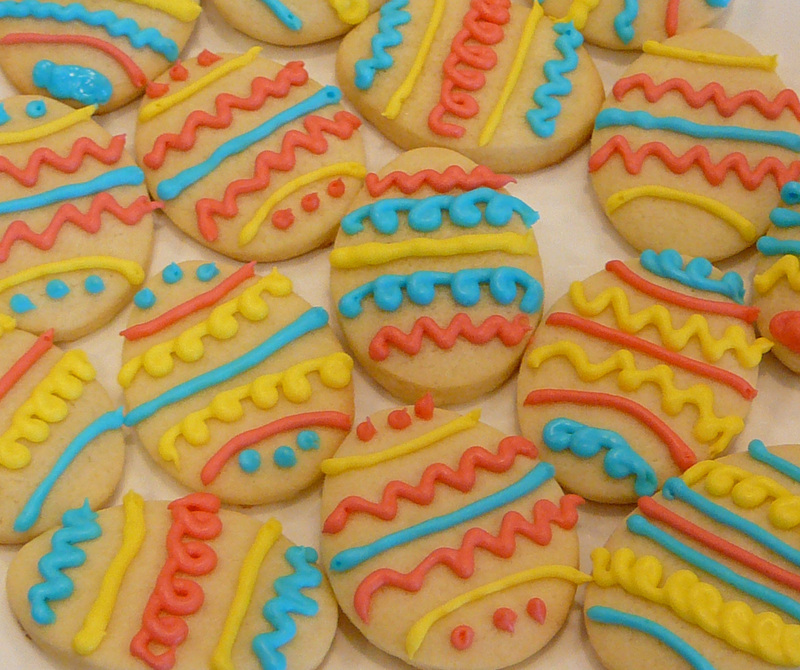 : Happy Easter Cookies! Today was a major baking day here. I made Easter cookies with the children, and two kinds of squares and pizza. I'll highlight the cookies today and save the rest for the next blog entries. I made the "Cookie Monster's Cookies" again and we shaped them like eggs, bunnies, chicks and butterflies. I did up a batch of royal icing and split it into three colors - pink, yellow and blue. While I let the children decorate most of the chicks, I decorated the eggs. It was wonderful to have three different colors, in three separate bags, all with the same tip. Made for a pleasure to work them. I was going to make them all the same but just started changing each one after 3 the same. It was fun. Along the way, I had to ice the chicks for the children to decorate. They were dunking them in sprinkles. They had fun too. I'm keeping those in our special family can that we can eat right away! Here are how my eggs turned out. Here's how the other cookies turned out. Not quite like the Easter Bunny does it, but not bad! Have a blessed Holy Thursday and I'll show you some more yummies tomorrow!